Description: Perennial to 1 m high, with the shoots extravaginal and arising singly or in fascicles from a loosely contracted or subelongate rhizome system often resulting in a loose or somewhat dense tussock. Leaves with sheath keeled, scaberulous; ligule c. 1 mm long, firmly membranous, truncate; blade mostly flat when fresh, 1–4 mm wide when expanded. Inflorescence mostly 8–25 cm long, somewhat contracted above. 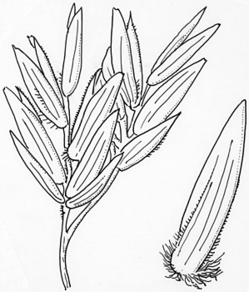 Spikelets 3–6-flowered. Glumes 3-nerved, acute or subacute. Lemmas obtuse, rather narrow to rather broad, web long, scanty to moderately copious; palea furrowed down the centre. Flowering: Flowers spring to summer. Distribution and occurrence: Often grows on stony soil in woodland on sandstone. Text by Jacobs, S.W.L., Whalley, R.D.B. & Wheeler, D.J.B. Taxon concept: Grasses of New South Wales, Fourth Edition (2008).